Plumbers, pipefitters, and steamfitters keep civilization in running water, sanitation, and heat for comfort and cleaning. Plumbers, pipefitters, and steamfitters install and repair pipe systems to transport water, chemicals, and waste. They use saws to make holes in floors and walls and pipe cutters to size pipe accurately. 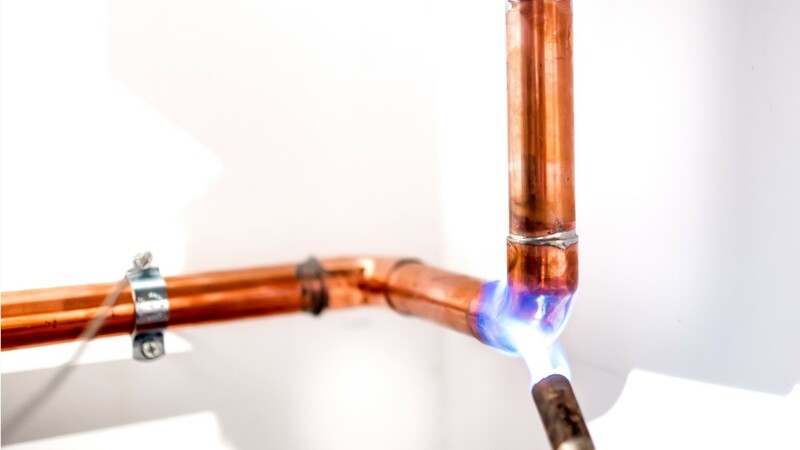 Plumbers work on water, drainage, and gas pipes in homes and businesses. They also install plumbing fixtures and appliances. They rescue homeowners from leaks, clogged drains, and malfunctioning septic systems. Pipefitters install and repair pipes that carry chemicals, acids, and gases— usually in power plants and industrial settings. Some install fire sprinkler systems. Steamfitters install pipe systems that move steam under high pressure; most work at college campus facilities and natural gas power plants. With high rates of injury on the job, precautions must be taken with common tasks such as lifting heavy materials, handling tools, and climbing ladders. Work schedules are full time, and may include nights, weekends, and emergency calls. A 4- to 5-year apprenticeship is typically required, combining paid on-the-job training with classroom study. A license is generally required for plumbers, and some states license pipefitters and gas line workers. Helpers assist experienced trades professionals, haul tools and materials, and clean work areas. They typically have a high school education, and learn on the job. Cut, thread, or hammer pipes to specifications, using tools such as saws, cutting torches, pipe threaders, or pipe benders. Lay out full scale drawings of pipe systems, supports, or related equipment, according to blueprints. Assemble or secure pipes, tubes, fittings, or related equipment, according to specifications, by welding, brazing, cementing, soldering, or threading joints. See more details at O*NET OnLine about pipe fitters and steamfitters. Pipe Fitters & Steamfitters by U.S. Department of Labor, Employment and Training Administration is licensed under a Creative Commons Attribution 4.0 International License.